Excellent investment opportunity Rental income of €33,600 per annum Entire extends to approx. 368.35 sq m (3,965 sq ft) Site extends to approx. 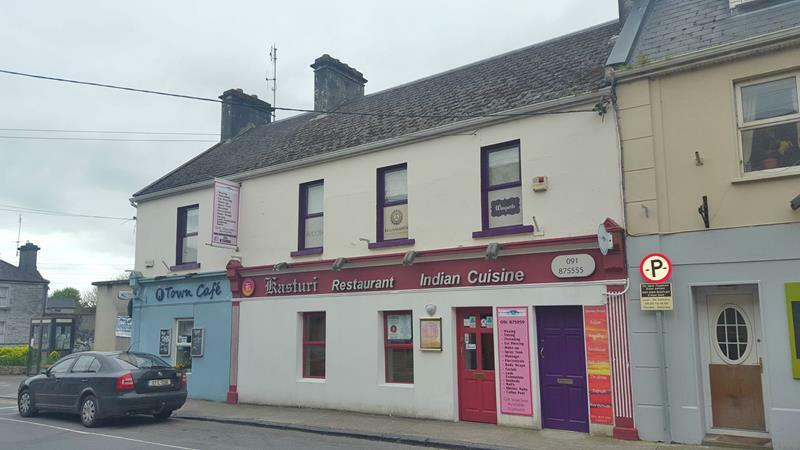 0.14 acres (0.057 ha) Tenants not affected The subject property is located in Athenry Town Centre and benefits from a high profile location on Cross Street. Athenry has a population of approx. 3,950 (CSO 2011) and is situated within the commuter belt of Galway City, approximately 25km east of the city centre. Athenry is served by the M6 Motorway which links Galway to Dublin with the interchange, Junction 17 approx. 2.5km from the property. By rail, the town is served by Athenry railway station which lies on the Galway to Dublin main line of the Irish rail network. The train station is approx. 650m from the subject property. Neighbouring occupiers include The Old Barracks Restaurant and The New Park Hotel. The property consists of a two storey semi-detached mixed use property with enclosed rear yard. On the ground floor, the property comprises of two commercial units (1 café and 1 Indian restaurant) and both units benefit from separate access to the front and rear yard. The first floor comprises one commercial unit (beauty salon) and one 1 bedroom apartment. Both units are accessed via a shared stairwell located to the front of the property. Lease details: Available on request. Title: We understand the property is freehold or equivalent long leasehold Town Planning/Zoning: The subject property is located in an area zoned Objective LU1 "Town Centre/Commercial (C1)" in the Athenry Local Area Plan 2012 - 2018.